George Mallory was an English explorer and mountaineer. He was a leading member of early expeditions to Mount Everest. He also fought in World War 1 as part of the Royal Garrison Artillery. In May 1917 he was forced to return to England to get his ankle injury operated on as it was very difficult for him to walk. He was born on June 18, 1886 in Mobberley, Cheshire. His complete name was George Herbert Leigh Mallory. He won a mathematics scholarship to Winchester College at the age of 13 years. In 1905, he enrolled at Magdalane College, Cambridge and studied history. 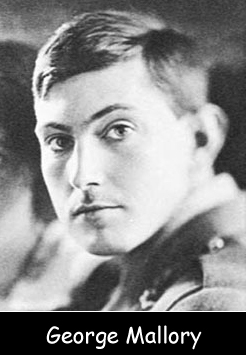 George Mallory developed his interest in rock climbing during his last year at Winchester College. In 1911 he climbed Mont Blanc and in 1913 he climbed Pillar Rock which is located in the Lake District. After completing his graduation George became a teacher at Charterhouse. He married Ruth Turner on July 29, 1914. They had two daughters and one son together. In 1921, Mallory was asked by Percy Farrar to be part of the first Everest expedition in 1922. George and Ruth Mallory both became active in the Labour Party. In 1924, He joined an expedition to Mount Everest along with Andrew Irvine which proved to be their last expedition. They set off for the top on June 8, 1924 but never returned and died somewhere in between.